People come to Therapy because they seek the best in beauty. Do you know someone who could use an update? Or someone who hasn’t yet discovered the best salon in Houston? Enlighten them with the life changing gift of Therapy Hair Studio. We will ensure that whoever you treat to our salon will leave feeling more beautiful than ever. They can experience a top-notch blow out, haircut, or hair color with one of our highly trained stylists. Or if hair isn’t where they want to start, how about a session with one of our Therapy makeup artists? They can experience a makeup application, try airbrush makeup for that picture perfect look or perhaps have a private makeup lesson to learn how they can achieve that professional look on their own. We provide endless possibilities for an exquisite salon experience. Anyone can walk into our salon and feel welcome. So share your secret with a friend this holiday season. Give the gift of Therapy this season and we will give you a gift! 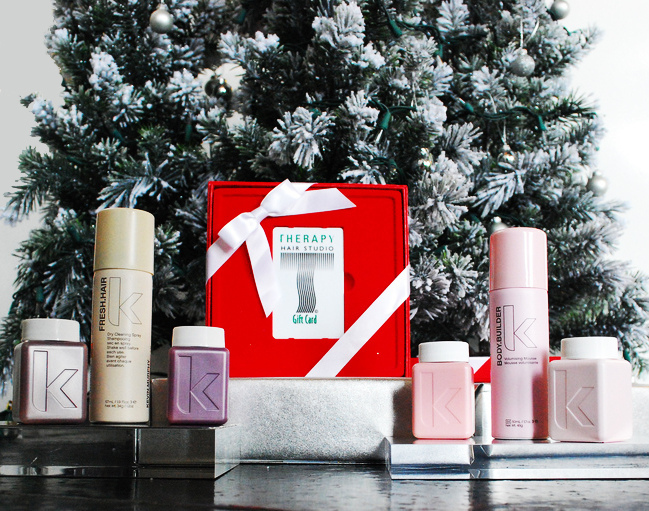 Buy $50 or more in gift cards and receive a travel set from Kevin Murphy. (Now through December 25, 2012 while supplies last).